Area students compete in the 2016 VEX Robotics Competition at UNM. 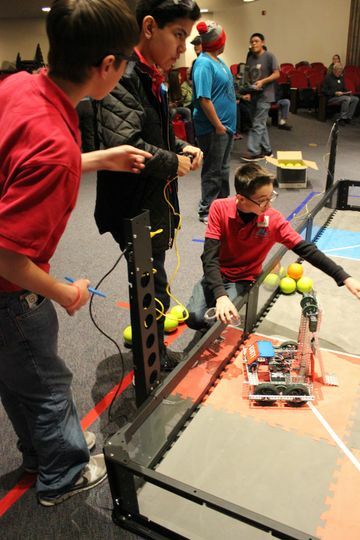 Teams of middle and high school students from across the state will gather at The University of New Mexico on Feb. 4 for the VEX Robotics Competition, sponsored by the UNM School of Engineering. The competition will be held at the Centennial Engineering Center at UNM. Qualifying rounds will take place from 10 a.m. to 2:30 p.m., and elimination rounds and finals will be from 2:30 to 4:30 p.m.
About 20 teams will come together, where they will battle against each other using robots created from the VEX EDR design curriculum. Participants will square off in the game “Nothing But Net,” which is played by scoring colored balls in high and low goals and by elevating robots in a designated climbing zone. Participating teams will come from Albuquerque, Farmington, Gallup, Mescalero Apache, Rio Rancho and Santa Fe public, private, charter schools, along with home-school groups and STEM societies. The UNM student chapter of the National Society of Black Engineers will provide snacks and lunch as part of their fundraising efforts. The UNM School of Engineering’s VEX Robotics Competition is one in a series of tournaments supported by the Robotics Education & Competition Foundation and various national, regional and local sponsors. The competition season culminates each spring, with the top-performing teams from local and state VEX Robotics contests competing against each other at VEX Worlds, where teams have the opportunity to challenge their top-ranked peers from around the country and over 30 countries around the world, including Brazil, Canada, China, Colombia, India, Japan, Malaysia, Mexico, New Zealand, Puerto Rico, Saudi Arabia, Singapore, Spain and United Kingdom. The VEX Robotics Competition is managed by the Robotics Education & Competition Foundation and serves as a vehicle for students to develop critical life skills such as teamwork, leadership and project management, honed through building robots and competing with students from the community in an exciting, non-traditional environment. The VEX Robotics Design System was built from the ground up and designed to be an affordable, accessible and scalable platform used to teach science, technology, engineering and math education worldwide.